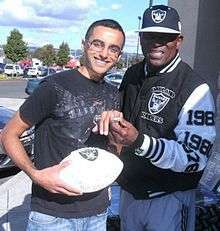 Clifford Branch (born August 1, 1948) is a retired American football wide receiver who spent his entire 14-year National Football League career with the Oakland/Los Angeles Raiders, winning three Super Bowl rings in Super Bowl XI, Super Bowl XV and Super Bowl XVIII. Branch holds the distinction of being the only wide receiver to be a member of all three Raiders Super Bowl teams. Branch graduated from the University of Colorado at Boulder in 1972 where he was a five-year letterman in football. During his time at Colorado, Cliff set the NCAA Division 1-A record for kickoffs returned for touchdowns with 8. Branch was selected in the fourth round of the 1972 NFL Draft with the 98th overall pick by the Oakland Raiders. 1970: 23 catches for 355 yards. 22 carries for 119 yards and 1 TD. 1971: 13 catches for 330 yards and 3 TD. 9 carries for 235 yards and 4 TD. Branch was also a standout track athlete. He set the University of Colorado at Boulder and NCAA Championship record in the 100 meters with a time of 10.0 seconds at the 1972 NCAA championships semifinal in Eugene. Branch placed 5th in the final with 10.1, and he said "My goal has always been to win the NCAA 100 meter championship. This is my last track meet, since I expect to sign a pro contract with the Oakland Raiders within the next two weeks." (which meant he would not run in the 1972 Olympic Trials). He also posted a personal best of 20.5 seconds in the 200 meters. Branch spent his entire 14-year NFL career with the Oakland/Los Angeles Raiders, winning three Super Bowl rings in Super Bowl XI, Super Bowl XV and Super Bowl XVIII. Branch caught 3 passes for 20 yards in Super Bowl XI, 5 passes for 62 yards and 2 touchdowns in Super Bowl XV, and 6 passes for 94 yards and a touchdown in Super Bowl XVIII. Cliff was voted a First team All-Pro in four consecutive seasons (1974–1977) and had 46 receptions in 1976 for 1,111 yards and 12 TDs, averaging 24.2 yards per catch. During this time, Branch was also named to four consecutive Pro Bowls from 1974–1977. In 1974, Branch led the National Football League in both receiving yards (1,092) and receiving touchdowns (13). During the 1983 season, Branch set the Raiders franchise record for the longest TD reception (99 yards), on a pass from Jim Plunkett. Branch finished his 14 NFL seasons with 501 receptions for 8,685 yards and 67 touchdowns. He also rushed for 70 yards and returned 9 kickoffs for 191 yards. When Branch retired he led the NFL in post season receptions (73) and yards (1289) for an average of 17.7 yards per catch, Scoring 5 TD's. ↑ "1972 NCAA Track and Field Championships" (PDF). 1972. pp. Pages 12, 15, 16. Retrieved November 10, 2013. 1 2 "Cliff BRANCH profile - all-athletics.com". Retrieved November 10, 2013.